'The Shannon Suite' for The Chatam Saxophone Quartet. 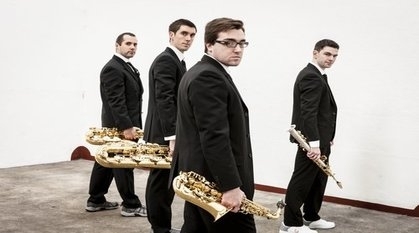 Ciarán has been commissioned by The Chatam Saxophone Quartet to arrange his three movement work, 'The Shannon Suite', for four saxophones, (soprano, tenor, alto and baritone). Established in 2008 at the DIT Conservatory of Music, the multi-prizewinning ensemble (Feis Ceoil, RTÉ lyric fm bursary, Galway Apprentice scheme) have quickly established a reputation for excellence and versatility, working across contemporary classical and jazz genres, regularly performing nationally and featuring in live broadcasts on RTÉ Radio and TV. The work when complete will be performed and recorded for a new album the quartet aim to release in 2013.